Within one period in my Senior English class going from a discussion of existentialism and Camus’s The Stranger to many students (and me) trying to buy tickets for Lollapalooza this summer. #got’em! Listening to the new collection of Miles Davis Live at the Fillmore in 1970 after listening to a Grateful Dead show from that same year earlier today. The powers of musical exploration and experimentation never fail to delight me. Fruit. There is a gentle simplicity in apples and oranges. I like when people use the term “hand fruit” to refer to fruits eaten while being held in the hand. 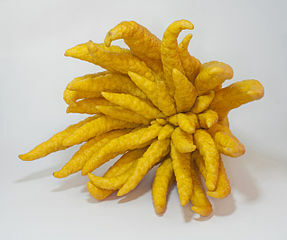 It makes me think of this fruit, the Buddha’s hand, which is complex and used for fragrance or decoration. I love the collection of short stories by Molly Antopol – The UnAmericans.